There’s no contemporary evidence that Galileo actually said those words, but it makes for a good story. It also exemplifies the frustration Galileo felt toward Church officials. Galileo had good reason to believe the Earth moved around the Sun. He had observed the phases of Venus, which showed that Venus moved around the Sun, and he had discovered four moons around Jupiter. Both of these observations agreed with the heliocentric model of Copernicus, which held that the Sun was the center of the universe. Heliocentrism was a huge theological problem for the Church. It seemed unthinkable that God’s divine creation — humanity — would be placed upon a minor planet, rather than at the fixed center of the physical universe. Besides, the Bible clearly states (in Chronicles 16 and Psalm 93 for example) that the Earth doesn’t move. The central dispute between Galileo and the Church was whether Galileo could assert that the Earth really did move around the Sun (that is, as a scientific fact), or whether he should present the idea as merely a hypothesis. Church officials admitted that Galileo’s observations gave the appearance of moving around the Sun, but argued that appearances could be deceiving. Galileo, they argued, hadn’t completely proven his hypothesis. Galileo, on the other hand, thought it was ridiculous to take poetic passages from the Bible literally. This raises an interesting question: is there an experiment Galileo could have done to prove that the Earth actually moves? It’s likely that nothing would have convinced the Church at that time, but there is an experiment Galileo could have done to demonstrate the motion of the Earth. All he would have needed is a large pendulum. The experiment was devised by Leon Foucault about 200 years after Galileo’s trial. A simple pendulum consists of a mass hung from a wire or string. Once released it will swing back and forth at a regular rate. With friction and air resistance, the swing of the pendulum will die down over time, but this happens slowly for a large and heavy pendulum. If the Earth were motionless, then a pendulum would swing back and forth in a perfectly straight line. It’s orientation would never change. But the Earth rotates, which means everything on the Earth moves around in a circle once a day. If you are on the equator, you would travel the entire circumference of the Earth in 24 hours. If you are near the north pole, you would travel only a small circle in 24 hours. This means that while everything on Earth moves in a circle once a day, things closer to the equator move faster than things closer to the Earth’s poles. Your speed depends upon your latitude. As a pendulum swings, it will be slightly closer to the equator at one part of its swing, and slightly farther away at another part. As a result, the motion of the Earth causes the orientation of the pendulum to shift slightly with each swing, an effect known as precession. The effect is very small, but it builds up. After several hours the orientation of the pendulum can be significantly changed. Watching the precession of a pendulum you can see the direct effect of the Earth’s motion. Galileo was right after all. Foucault first demonstrated his pendulum in his cellar. His experiment gained such popularity that he was soon asked to demonstrate his pendulum in the Pantheon in Paris, where there is a Foucault pendulum to this day. 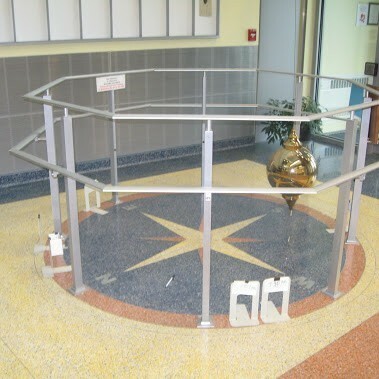 If you happen to be in the Rochester area, there is a Foucault pendulum a little closer to home. Simply take a trip to the science building at SUNY Geneseo. Included here are some pictures of their pendulum. Centuries earlier, Aristotle had refuted heliocentricity, and by Galileo’s time, nearly every major thinker subscribed to a geocentric view. Many people believe wrongly that Galileo proved the heliocentricity. Galileo could not answer the strongest argument against the heliocentric theory, which was made nearly two thousand years earlier by Aristotle: i.e. if heliocentricity were true then there would be observable parallax shifts in stars’ positions as the earth, moved in its orbit around the sun. In absence of a valid argument even Copernicus refrained from publishing his heliocentric theory for some time out of fear of ridicule from his colleagues. However given the technology of Galileo’s time, no such shifts in their positions could be observed. It would require more sensitive measuring equipments than was available in Galileo’s day to document the existence of shifts, given the stars’ great distance. Until then the available evidence suggested that the stars were fixed in their positions relative to the earth, and, thus, that the earth and the stars were not moving in space —only the sun, moon and planets were. Unfortunately throughout the Church history there have been those who insist on reading the Bible in a more literal sense than it was intended. They fail to appreciate, for example, instances in which Scripture uses what is called “phenomenological” language—that is, the language of appearances. Just as we today speak of the sun rising and setting to cause day and night, rather than the earth turning, so did the ancients. From an earthbound perspective, the sun does appear to rise and set, and the earth appears to be immobile. When we describe these things according to their appearances, we are using phenomenological language. The phenomenological language concerning motions of the heavens and the non-motion of the earth is obvious to us today but was less so in previous centuries when the scientific discoveries were primitive. Whenever Galileo is mentioned, someone usually comes with a comment about how the Church wasn’t against Galileo’s scientific ideas, and that the Church supported scientific study. The reality is much more complex, and the Church was not entirely blameless regarding opposition to scientific ideas. The fact that stars do not appear to move with inferior optical devices is not an argument against the heliocentric model. It is not an argument for anything, since the possibility that the stars are simply too far away is obvious. As such, this cannot be used as evidence either way. To suggest otherwise is pure stupidity. With my most solid respect for your journals, I would like to only suggest that the Christian Bible may suggest in Psalms 93 that the Earth doesn’t move. In my Hebrew Writings, Tehillim 93 (Psalm) reads that no one can move the Earth. For example; in the world my cat lives, I cannot be moved. Yet I do obviously do move. It is noteworthy to mention that I am not a Christian. My above comment was not to support or regect the Christian Bible. However, I do battle with what Christianity has done to honorable Jewish literature. Sometimes I get down right disgusted. The Church, all of them, and science, have nothing in common. People make gods. Gods don’t make people. No evidence for fairies, angels, devils, heaven nor hell. Nothing. Plenty of evidence for plenty of gods among plenty of people, and plenty of priests selling heaven, hell, etc., wearing funny outfits, teaching the fear of sexual pleasure—key to the inner slave. Religion is the ideology of death, nothing less. Broad brush statements such as these simply aren’t true. Isn’t the hourly precession as describe due only to the earth’s rotation on its axis, as opposed to the earth’s revolution around the sun? It seems to me that the precession due to the earth’s rotation would take much longer to manifest and would be a more complex observation.